If you are in need of an affordable range of superior CNC manufacturing services in Perth, you have come to the right place. With a wealth of experience providing the highest standard of CNC machining and manufacturing in Malaga, Facet Engineering is best placed to cater to your specific needs. We have a proven track record of expertise, access to cutting-edge technology as well as the facilities and dedication to provide the precision finishes you require. Contact us today for more information on CNC manufacturing services in Malaga. Why choose Facet Engineering’s CNC manufacturing services? 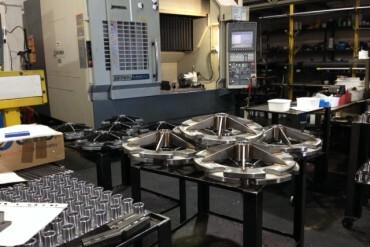 The CNC machining process is a popular and well-established feature in the manufacturing sector which incorporates the use of computer-controlled machine tools. By relying on the sophisticated guidance of computers, the likelihood of error is significantly reduced, ensuring that superior engineering finishes are achieved. The tools that are compatible with CNC (Computer Numerical Control) include lathes, routers, mills, and grinders. Whether it’s Facet Engineering’s CNC fitting and turning or CNC lathe machining and manufacturing, the heightened control of all of the elements that make for efficient manufacture (including the computerised reading of design information) all but guarantee the elimination of errors. CNC lathe fitting and turning are tailormade for customisation making them the ideal option for custom work and complex finishes across a variety of materials. We pride ourselves on our ability to produce high-quality finishes, in the shortest time possible and at prices that won’t break the bank. Contact us today to find out how we can assist you with our CNC manufacturing in Perth.